Vanessa Sims, senior vice president, executive director of diversity and inclusion at UMB Bank, recently accepted the Health Equity Partner of the Year award. For the past six years, UMB Bank has partnered with the Black Health Care Coalition (BHCC). The BHCC provides real and lasting resources to people in the community who need it the most. 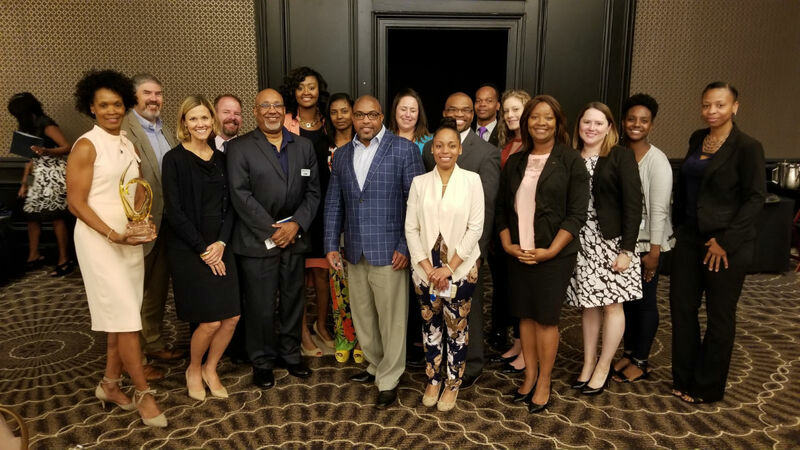 At UMB Bank, we have an entire business resource group called B-EPIC, which stands for Blacks Empowering People through Inclusion and Collaboration. B-EPIC and others at UMB have enjoyed the opportunity to work with BHCC to provide resources and make a difference in our community and we’re grateful for the teamwork and the impact we’ve made. A few years ago, we asked how we could go deeper with our partnership and have a more holistic approach to supporting this organization. Together, we sought out community needs and helped move beyond expectations and traditional boundaries to meet them. We listened to what was being asked by the community and explored strategic solutions to provide answers. Through this partnership, UMB provided community resources for the families that BHCC served. For the past three years, UMB facilitated financial wellness classes for expecting families and provided gifts and resources to expectant mothers. UMB also recognized BHCC’s need for space and facilities, so UMB helped secure a space by donating a brick and mortar location for the BHCC to use. In addition, BHCC wanted to increase breast cancer awareness through mobile screenings in the urban core. These screenings took place at hair salons serving women throughout the community. At UMB, we connected the BHCC with additional salon options in the urban core to support their goal to increase screenings and awareness. At UMB, community partnership is ingrained in our company’s core values and is embraced by our associates. The work that BHCC does makes a significant, positive impact on peoples’ lives, and I speak on behalf of all UMB associates when I say we are proud to be a BHCC partner and to be named the Health Equity Partner of the Year. Learn more about UMB’s business resource groups for associates and the organization’s commitment to diversity and inclusion. I would like to know how to get involved in this program.